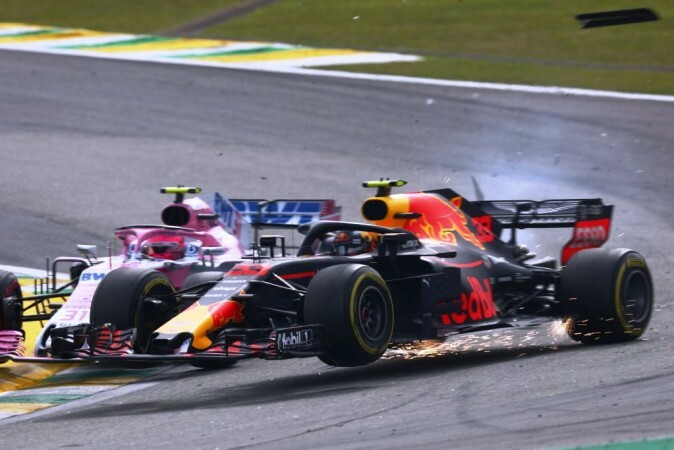 A dramatic collision while battling the lapped Force India of Esteban Ocon left Max Verstappen to settle for P2 at the end of the race. The incident also allowed Lewis Hamilton to secure his 72nd career win. 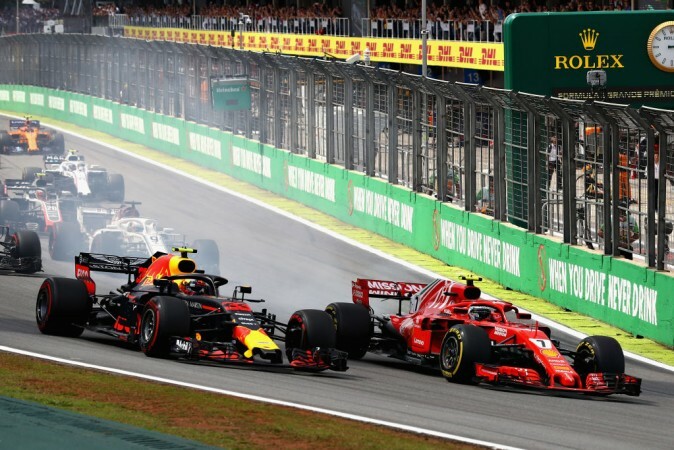 The penultimate race of the 2018 Formula One season on Sunday at Brazil's Autodromo Jose Carlos Pace better known as Interlagos could have been a boring race. Lewis Hamilton had already sealed the 2018 driver's championship at Mexico and the only question remaining was, which team will win the constructor's championship. With Hamilton on pole position, the pre-race feeling was that it could be another cakewalk for Mercedes. However, the 2018 Grande Premio Heineken do Brasil had high octane drama to unfold. Hamilton had a perfect start and his teammate Valtteri Bottas quickly moved to P2 from P3 overtaking Sebastian Vettel of Ferrari. Kimi Raikkonen maintained P4 in the initial part of the race and it looked like a Mercedes-Ferrari P1 to P4 in Brazil. No, it was the day of Red Bull's Max Verstappen as he was unstoppable from start. The 21-year-old Dutchman with impressive race pace moved to P2 by lap 10 after passing both Ferraris and then Bottas. Hamilton foresaw the danger and made an early stop for tyres on lap 19, switching on to mediums while Verstappen stayed out until lap 35. Verstappen re-joined the race with just 2.5 seconds behind Hamilton in lap 37 and he overtook the Briton on lap 39. He pulled away with a brilliant race win on the horizon. The backmarker is supposed to be given way to the leaders but Racing Point Force India's Esteban Ocon made a huge error. Verstappen went to the lead as Ocon gave a lot of room for easy overtaking. However, both drivers refused to yield, with Ocon holding out outside of turn 1 before the pair touched, sending both drivers into a spin. Hamilton who was behind Verstappen found a safe way between the two and before going on to record his 72nd career win. Verstappen was left unimpressed, as were the stewards, who duly handed Ocon a 10-second stop-go penalty for the collision. 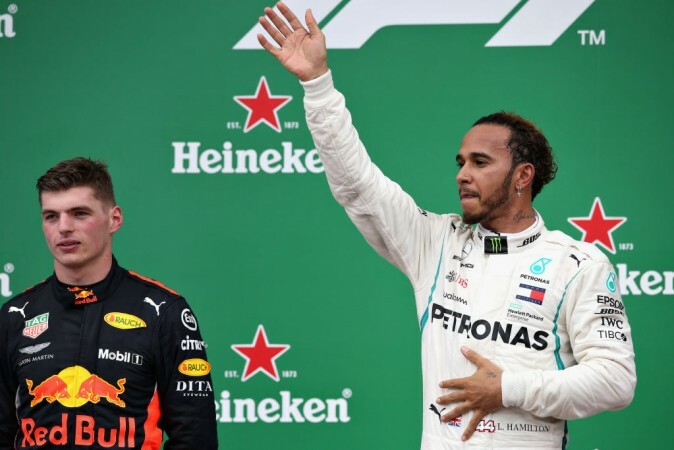 In the end, Verstappen had to settle for P2 behind Hamilton for the penultimate race of 2018 Formula One season. In a thrilling final few laps, Raikkonen just managed to hold onto the final podium position from a charging Daniel Ricciardo (Red Bull) who finished fourth. Bottas took fifth and Vettel sixth, while Sauber's Charles Leclerc drove a fine race to claim the best-of-the-rest prize in seventh. Verstappen was obviously furious over the incident and said, "What an idiot," over the radio. However, the frustration didn't end there as a war of words has broken out between Verstappen and Ocon post-race. Video footages of showing an incensed Verstappen confronting Ocon in the drivers' weighing area emerged soon after the race. Verstappen hadn't calmed down much when he faced the media later on. "To get taken out like that, and to get a stupid response from his side as well, I was not happy about that," said Verstappen. "I'm just trying to do my race and suddenly a backmarker is... just taking a stupid risk, to dive in on the inside. What can I do about it? The penalty for me today is that I lost the victory. Hopefully, in 15 years we can laugh about it."